Have you seen Twitter testimonials on other business websites or blogs? How cool, right? But you probably figured you’d need some sort of computer genius techy-tech skills to get this up on your own online presence. Well, I’m happy to say, not at all. It’s actually really easy! BUT, Twitter just recently updated their API (Application Programming Interface ie. how software components interact with each other), which means that if you followed my (and Charlene’s) previous advice and got those testimonials up on your site, you’ll see that they are no longer there. So, you will have to go through and get it set up again. And things are a little different, so I’ve put together a new set of step-by-step instructions for embedding Twitter testimonials. And if you’re never heard of this Twitter strategy before, you can start from a clean slate, and read on for the instructions. What is a Twitter testimonial? What I mean by a Twitter testimonial is a tweet that mentions you in some sort of positive way – whether praising your product or service, thanking you for the content you create on your blog or newsletter, or any sort of tweet that gives you some lovin’ and makes you look good (don’t be shy – you know you deserve it). Before you can set up and embed Twitter testimonials, you will first have to curate the tweets that you deem to be positive praise. And this all happens through “favorite” tweets. It’s as simple as logging into Twitter and marking these tweets as “favorite” by clicking on the “favorite” button. Power tip: It’s become a new Twitter tactic to favorite all kinds of tweets in an effort to catch attention of Twitter users and hopefully get them to follow you. One reason I don’t recommend this tactic is that it will muddy up your favorite tweets, so that they won’t be suitable to use for this Twitter testimonials tactic. 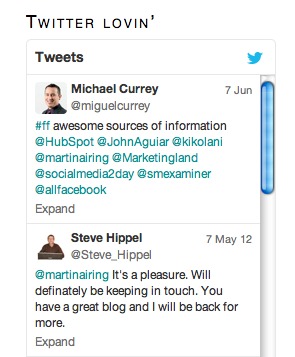 Now that you have marked some tweets as favorite, you’re ready to get them on your site with a Twitter widget! Step 1: Head to the “Settings” area of your Twitter account. Step 2: Click on the “Widgets” tab. Step 3: Click on “Create New”. Step 4: Select the “Favorites” tab. Step 5: Customize your settings. Adjust the height if you want to (note that the width will automatically configure itself to fit within the area you insert it on your website. So if you put it in your sidebar for example, it will automatically adjust itself to fit the width of your sidebar. It is possible to do custom configurations in terms of sizing, but this is where more techy skills come into play). FYI: The minimum width of a Twitter widget is 180px and the maximum is 520px. The minimum height is 200px. Pick either the “light” or “dark” theme, depending on what would look best on your website or blog. Customize your link colour if you want. Click into the link color field to activate color options. If you’ve used this widget in the past, you’ll remember that there was the option to customize the title at the top of it. With the new Twitter API, this is no longer possible. *Note that throughout the whole process, you can see the preview of what it will look like on the right hand side. Step 6: Copy your code. Step 7: Insert code into your website. How to insert code may vary slightly from website program to website program. If your website or blog runs on WordPress, you can easily add this code using a widget. Access your widget via the “Appearance” tab. Add a “Text” widget. Paste the code into the box. If you want to add a customized title, you can do so on your Text widget in the “title” area. And there you have it! Rockin’ twitter testimonials on your website or blog! BONUS – you can use the exact same steps to add other Twitter widgets to your website. One of the most popular is having your recent tweets showing on your site, to enourage site visitors to follow you. Follow the same steps as above, this time clicking on the “User timeline” tab (see picture of Step 4 above). Full details about embedding Twitter widgets including some advanced options, can be found here. If you don’t manage your own website, just get in touch with your web team to help you get this set up on your site. If you had this set up previously, and you haven’t heard from your web guys, reach out to them to make sure that they updated your Twitter widgets for API 1.1. Are you going to use this tip? Go ahead and leave a link to your site or blog in the comments to show off where you’ve put your Twitter testimonials. And if you have questions, I’m here and always happy to answer. Great look at using tweets as testimonials. This is something everyone should look at. We’ve all probably been mentioned by followers on Twitter and thought to ourselves, ‘Wow, I wish I could share this with my customers and readers!” Helpful tip. Glad you found it useful Heather! What a nice trick. Everybody must see this. This is kinda useful in posting testimonials on our blogs. Thanks for sharing this. As I always thought there is a wide collaboration between most popular social sites. Just play the codes and algorithm. There really are so many possibilities with social media integrations. This is definitely one of my favourite ones! Thanks for the great article, Martina. The way tools are always changing, nearly every article has an expriation date. Thanks for updating my article for the newest Twitter tools. I love this strategy for using tweets to embed testimonials into website. It’s such a smart thing for every business that is on Twitter. And it’s so easy to collect those tweets. I hope your article reaches lots more people with this great idea. I love this strategy too! Thanks for being the inspiration for this tip. Testimonials are so important for small business and this is such an easy way to display them, while also leveraging a Twitter presence. Appreciate your comment Charlene! Awesome Ti! Thanks for popping by! Previous post: Boundaries… where do you draw the line as a business owner? Next post: Are people complaining about your business without you knowing about it?